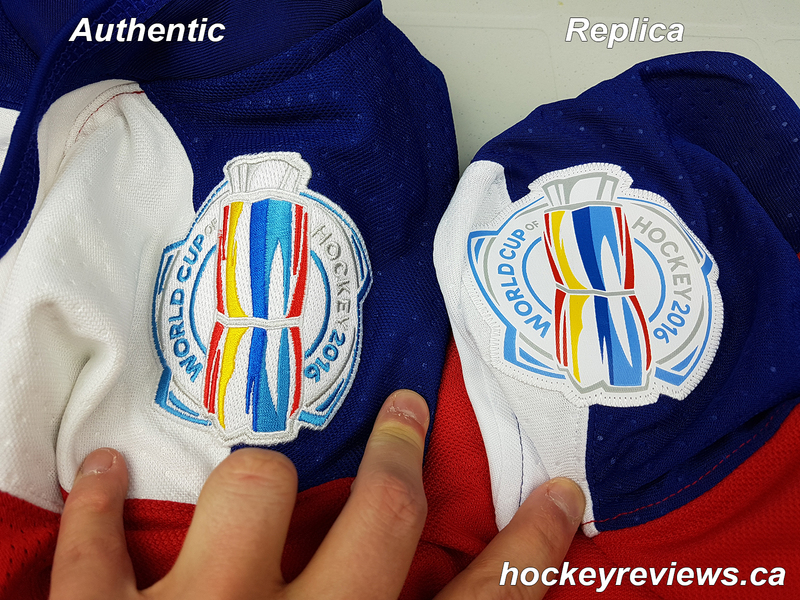 These videos show detail and go over the differences with Adidas World Cup of Hockey (WCH) Authentic jerseys and their Replica Premier counterparts that were worn and sold for the NHL’s Olympic competitor in September of 2016. 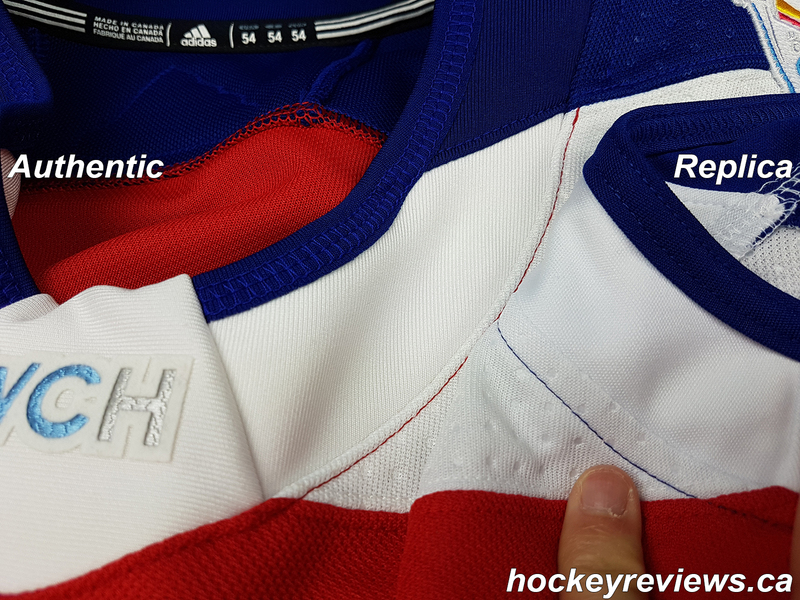 Hopefully the photos and the videos will show off the differences between the Authentic and Replica jerseys and perhaps might be a glimpse of what to expect in the future when the NHL transitions its jerseys from Reebok to Adidas and Fanatics. 1) While the materials are slightly different and the Authentic is thicker, they look very similar and from a glance the logos look and feel identical. 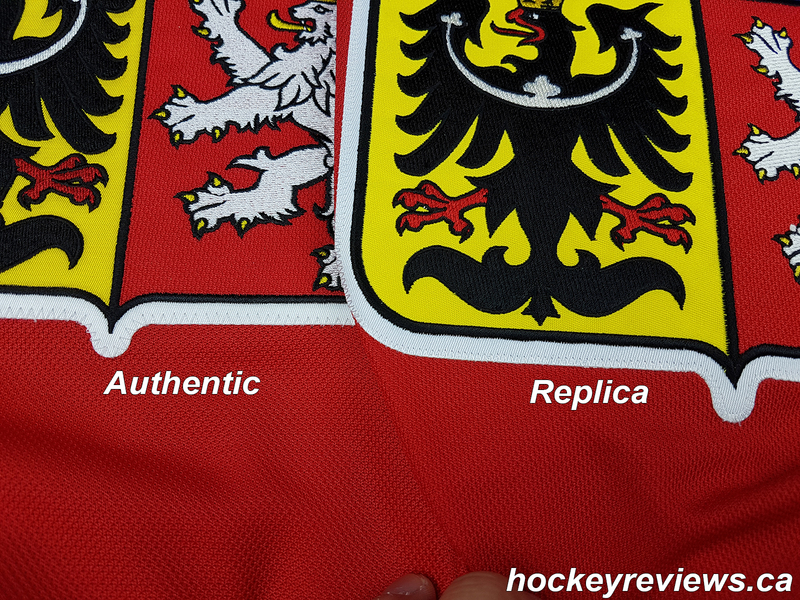 2) Closer up inspection of the logos shows better attention to detail and quality of stitching on the Authentic. 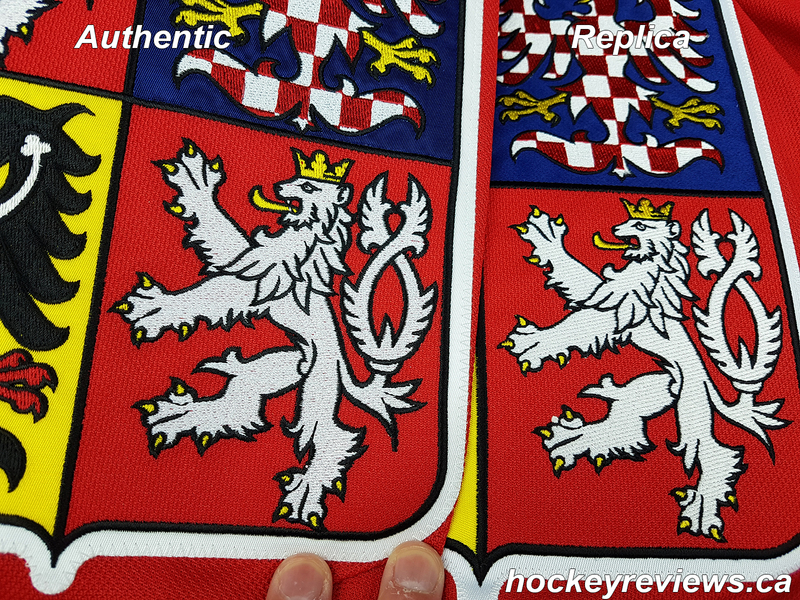 3) The stitching is more uniform and cleaner on the Authentic, which overall uses less thread and stitches. 4) The yellow in the logo feels of a slightly different material and has a slightly different colour to it. 5) The blue bird material also had a slightly different texture. 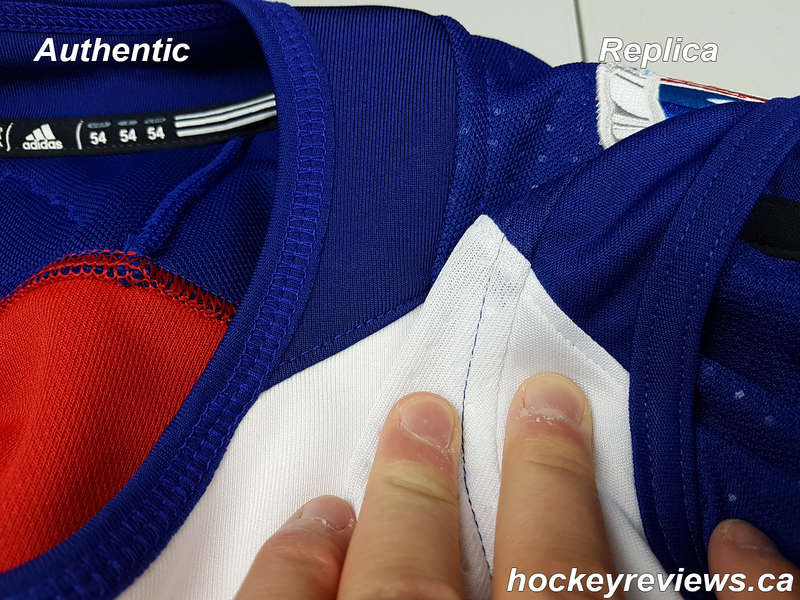 6) The stitching on the backside shows the cleaner job done on the Authentic. 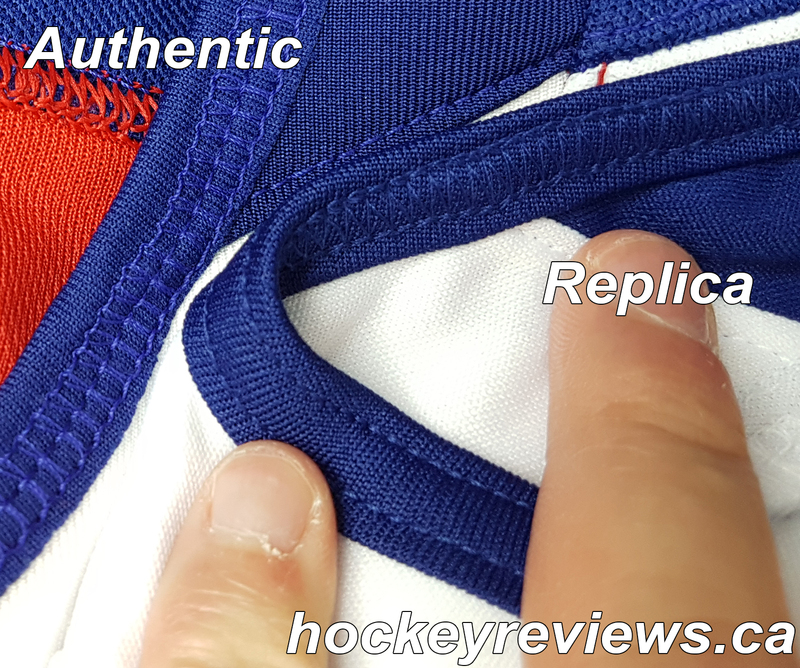 7) The replica jersey has the familiar sizing tag on the lower front corner of the jersey that is on NHL Premier jerseys. 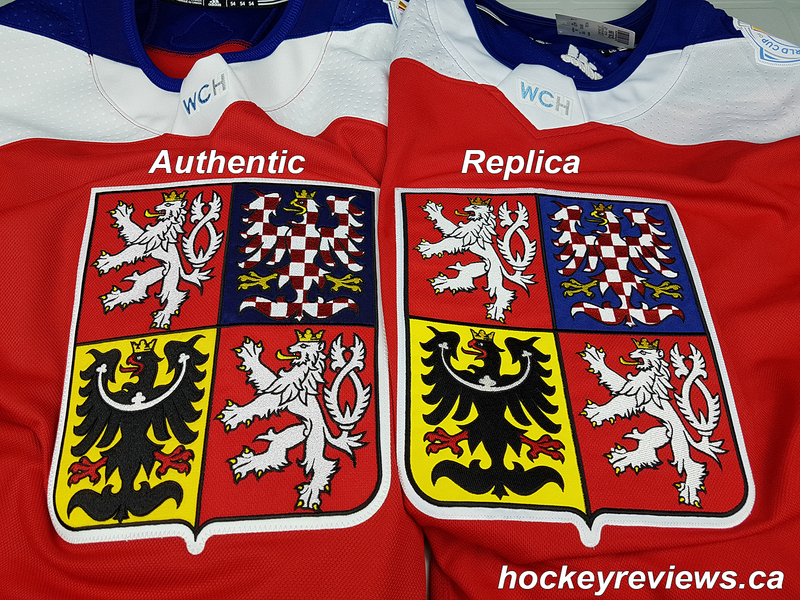 8) The WCH logos are the same fuzzy material (similar to newer NHL shield materials) but the material it is on is different and thicker on the Authentic. 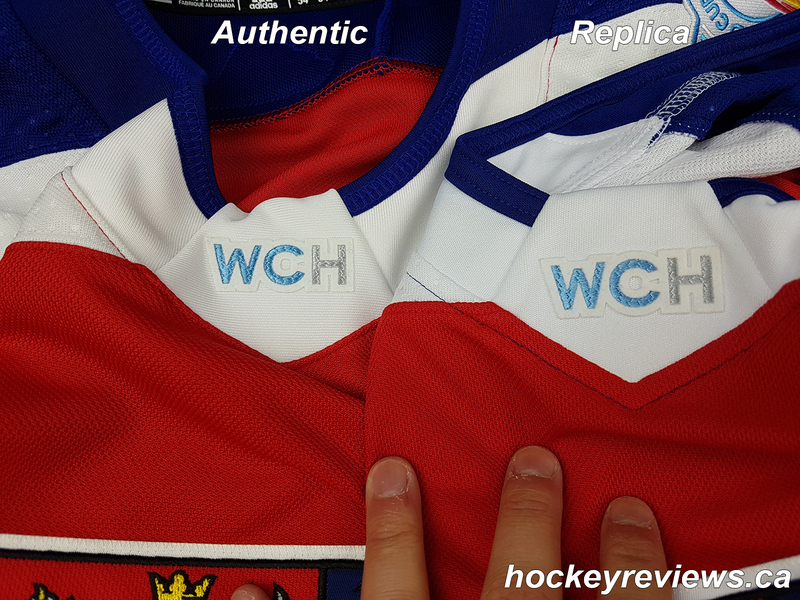 9) The Authentic WCH patch is an embroidered patch while the Replica is a screen printed vinyl patch. Both are sewn into the jersey. 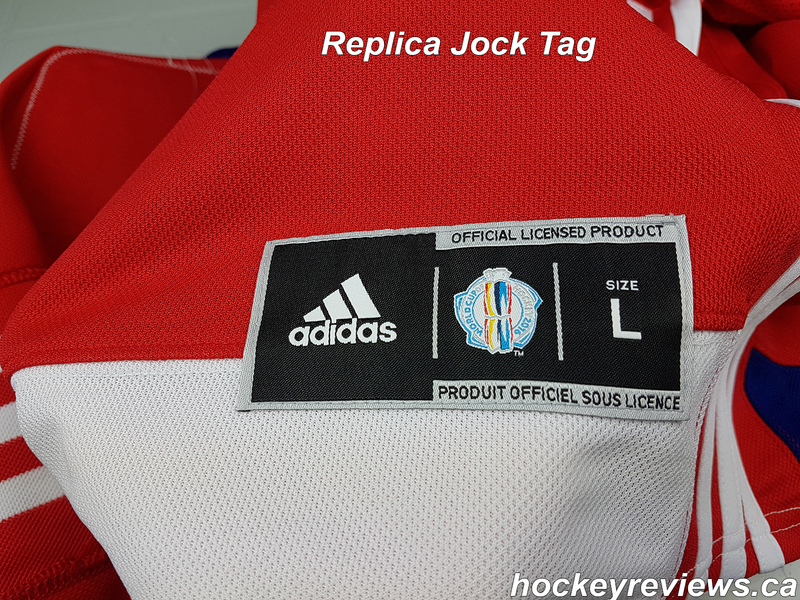 10) The inside tagging on the Authentic shows the Made in Canada origin and that the Adidas logo on the back is an embroidered patch compared to the embroidered logo on the Replica. 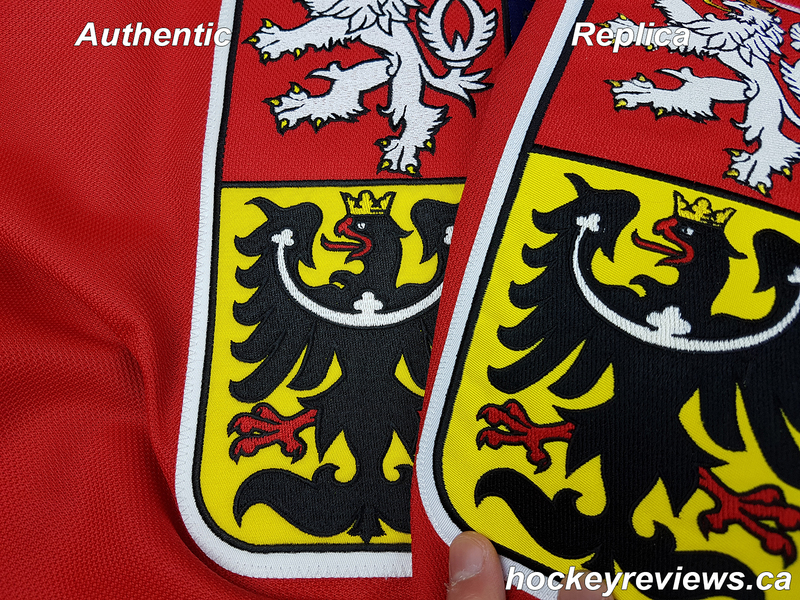 11) Showing off the different stitching on the collar where the Authentic is thicker and heavier. 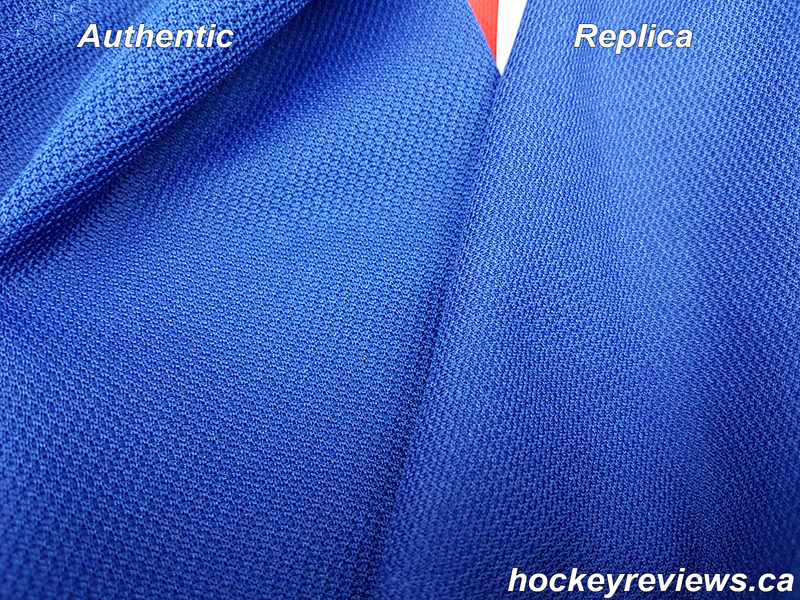 Also showing off the slightly different materials on the white and blue portion of the neck with the Authentic again being thicker and heavier. 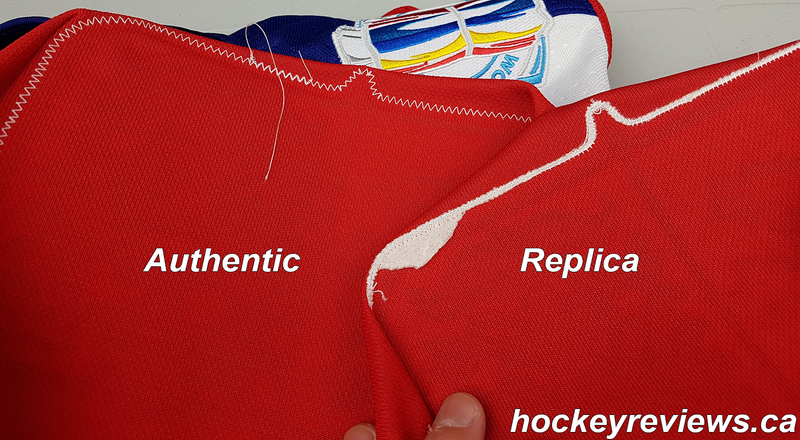 This image also shows off the red neck stitching on the Authentic compared to the blue used on the Replica. 12) Another close up view of the neck details. 13) Closer image of the collar stitching. 14) The Adidas 3 stripes on the side of the jersey is sublimated into a panel on the Authentic while it is sewn 3 stripes on the Replica. 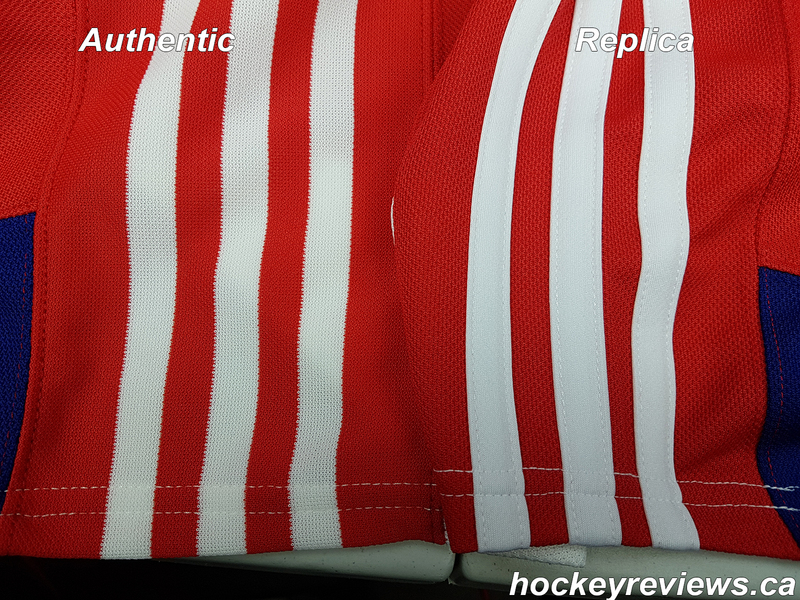 This is similar to Adidas Authentic soccer jerseys where the Authentics have thin glued on strips of material compared to the sewn stripes of the replicas. 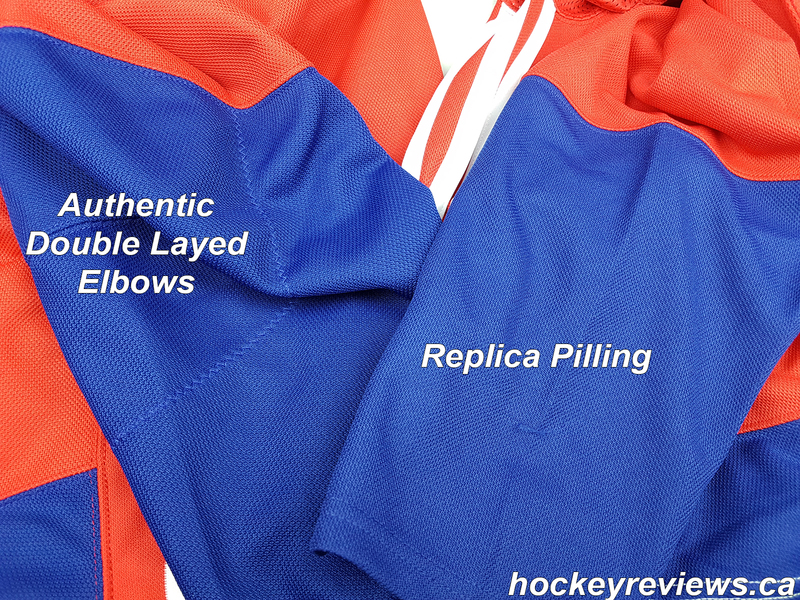 15) Shows off the double elbows on the Authentic and the thicker material found throughout the jersey. The Replica shows signs of pilling without being worn. 16) Close up view of jersey materials. 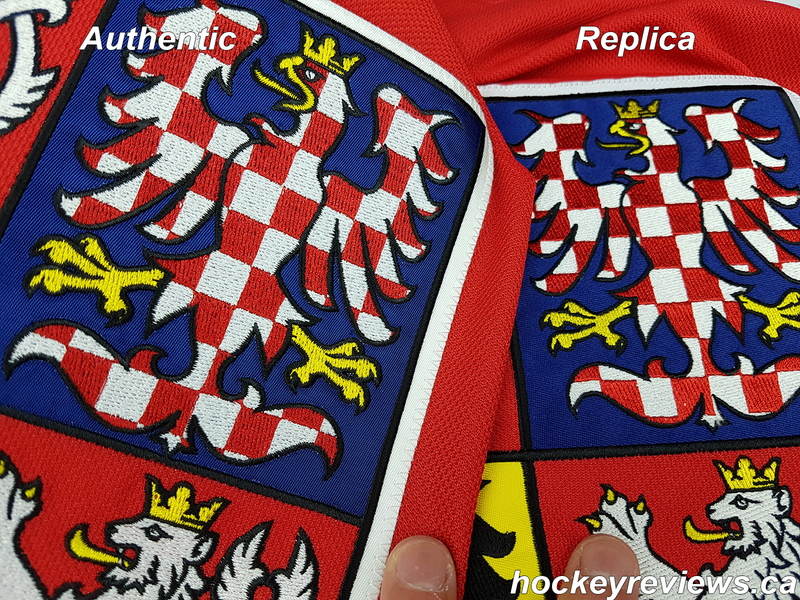 Authentic is thicker and more coarse compared to the Replica. 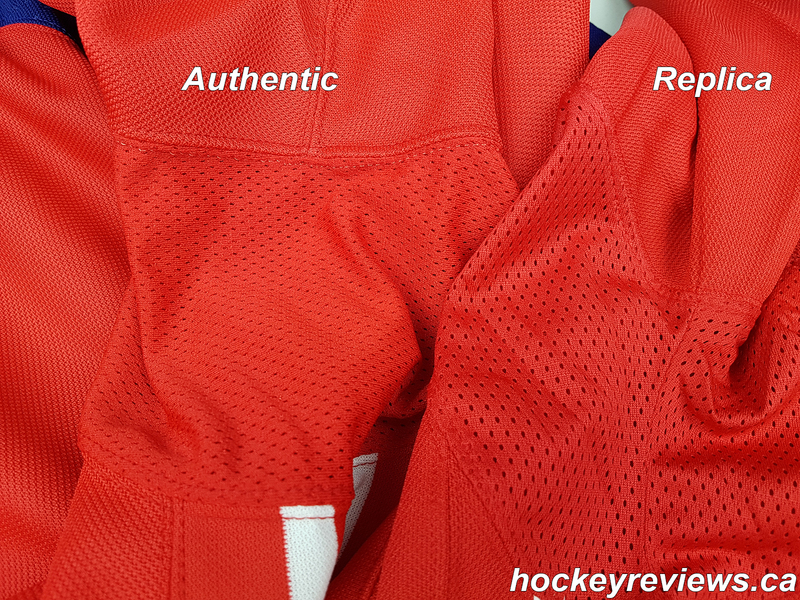 17) Underarm mesh fells thicker with less holes in the Authentic compared to the Replica. Hillsy, it’s Burghall! Where do you get your replica jerseys from? The ones in this video/post were from Winners. Otherwise usually sport chek.